The present volume is an addition to the publication series "Sylloge Nummorum Sasanidarum Paris – Berlin – Vienna" edited by the Numismatic Commission of the Austrian Academy of Sciences. It contains the Sasanian and Sasanian-type coins in the collections of the Hebrew University (Jerusalem), the Israel Antiquity Authority (Jerusalem), the Israel Museum (Jerusalem) and the Kadman Numismatic Pavilion at the Eretz Israel Museum (Tel Aviv). Altogether 282 coins are catalogued according to the same typological criteria as in the main series "SNS Paris – Berlin – Vienna". 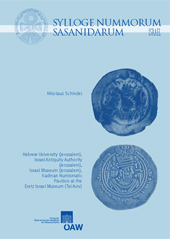 Apart from this material, a Late Sasanian copper hoard, containing more than 1800 specimens, is included which is so far unique in its size and scientific importance.With the publication of SNS Israel, for the first time a comprehensive catalogue of the entire holdings of Sasanian and Sasanian-type coins in the public collections of a single country is available.